At CFD, we have the fencing style and type to match your tastes and design while withstanding the harsh conditions of New England winters and blistering summers. When you're looking for vinyl Illusions Vinyl Fence is the way to go. Made in the US, with 36 Principal colors and five wood grains. Visit us in Amherst, NH, to learn more about our vinyl fence materials and installation. When you're seeking a more traditional option and are interested in wood fencing, then our team at CFD has have you covered as well. We've got many options, including white cedar, western red cedar, or hardwood, spruce and Hemlock. We also carry chain link, a popular choice for residential and heavy commercial fence applications. Ornamental fences both steel and Aluminum are a popular choice for residential applications, pool, and commercial use. Alumi Guard is one of the many brands CFD carries and installs. It is made in the US and has a powder coating process that is certified by DuPont. These fences are available in tan, white, black, green, and light bronze, and Florida bronze, in multiple styles. Equine Fencing is one of our specialties. Vinyl, Wood, Polyethylene are some of the materials used in the equine industry. We have designed and installed some of the largest Equine fences in the area. Just because you don’t see a fence listed on our site or in our gallery doesn’t mean we can’t get it or make it for you. Bring us your ideas, photos and let our eager design team help you bring it to life! We make safety and strength our number-one priority with all our fence choices, from residential to horse fencing. 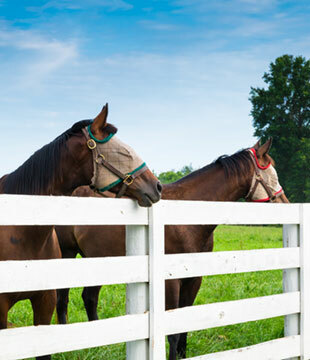 Only equine vinyl fencing has a rail lock system that protects your horses and other livestock. The fence will flex under pressure and absorb impact rather than break. Under extreme stress, such as the type that could injure a rider or horse, a rail lock will release and provide extra protection. We also offer equine fencing in other materials such as hardwood, spruce, hemlock, and locust. Crowe Fence & Deck Supply will build your gates to enhance and compliment the look of your home or commercial premises. Whether your requirements are for security, privacy, or simply ensuring the children and pets are safe and away from the danger of swimming pools or passing vehicles, we will make you a top quality gate that will satisfy your needs. We build Wood, Steel, Vinyl, Aluminum, Chain Link, and Bar-way Gates. Let us know what you want; we are at your service.